There is nothing romantic about being cold. The above picture is of one of the first snows, taken in early December. 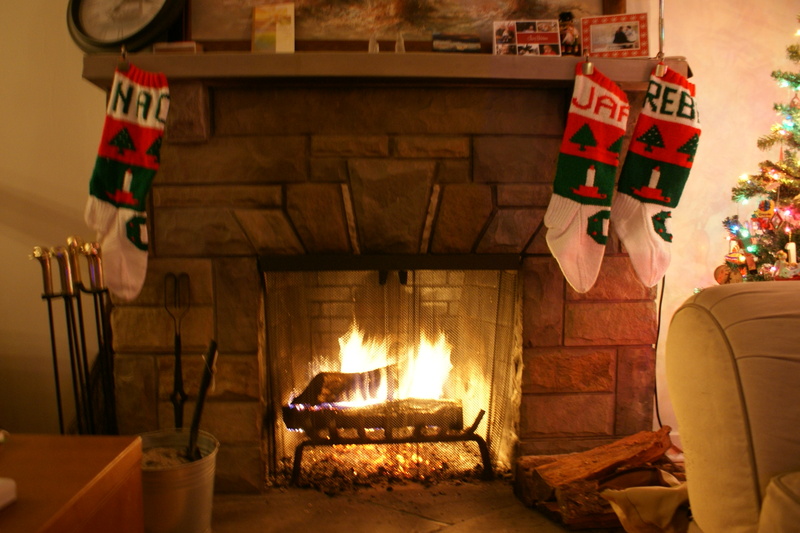 Back when snow was still enchanting and pretty, and chilly evenings were an excuse to make cozy fires. Yet even back then, I knew I would write this post. My mother, my little sister, one of my best friends, and many other unobjectionable people were born in March. My apologies to them, because apart from their existence, March is not my friend. March is supposed to be spring. On those little schoolroom calendars, March is in the quarter of the poster with flowers and green grass and colorful eggs. The very phonemes of the word “March” are indelibly linked in my cultural consciousness with the idea of the season of spring. March is a jerk. March is that bully that dangles candy in front of your face and then smacks you upside the head. March gives you a day or two of warm, sunny weather, then BAM ANOTHER FOOT OF SNOW, YA HOSER! (March is Canadian.) I do not trust March. We are only eight days into March, and I already resent it. Puddleglum is my patron saint in March. I wear Puddleglum colors, and a Puddleglum scowl. 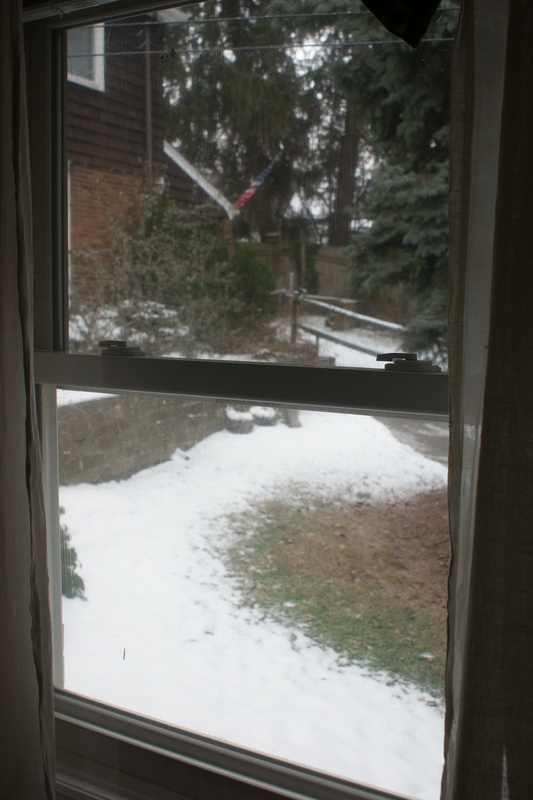 Every time the weather gets above freezing for a few hours, and some innocent, optimistic soul starts singing a song about the nearness of spring, I give them a dirty look and remind them of the date. February’s socks didn’t help the situation that much. 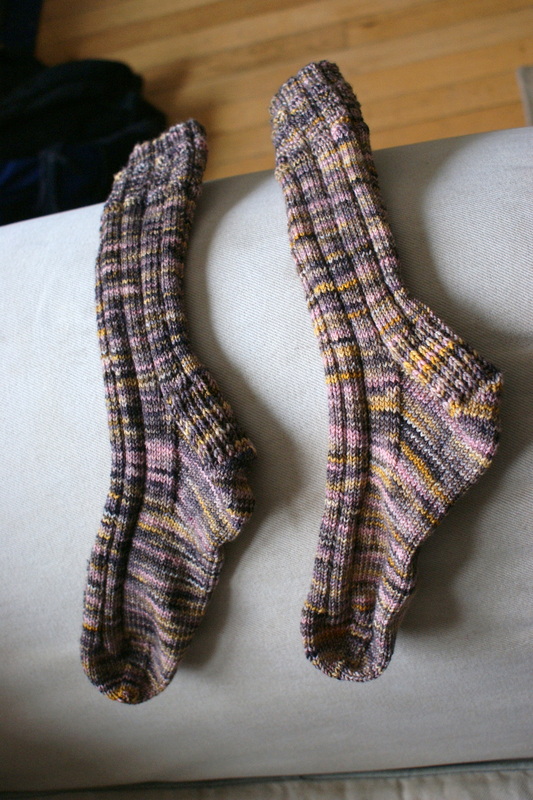 I was rather preoccupied with Olympic knitting for most of February, so I tried valiantly to crank this pair out in the last week of the month. Faithful monogamy got them finished on March 3rd; not bad, says me. This makes them only the second pair in this series to be late; last time I had the excuse of new parenthood. 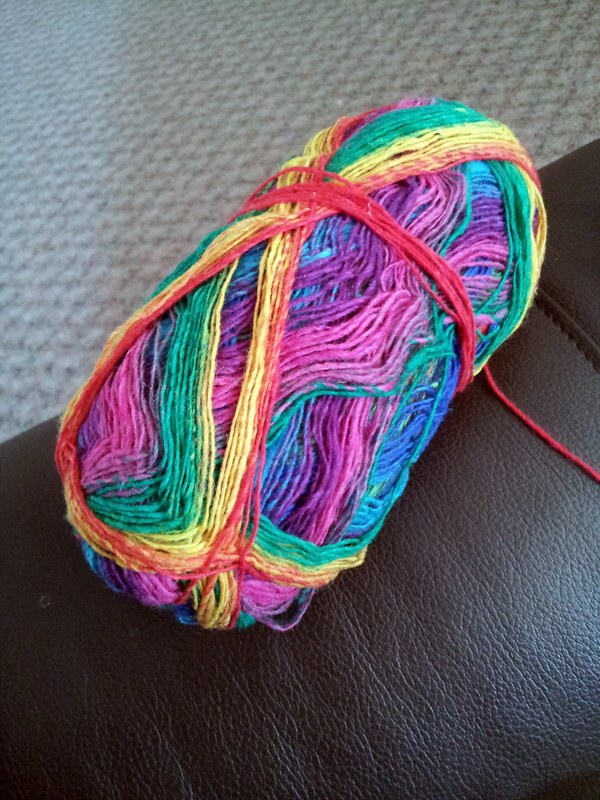 Yarn review: This was my first time using Koigu’s famous KPPPM, in the romantically-named color P814L. I acquired this way back in 2010, about this time of year, on our peripatetic tour of New York City that included a stop at School Products. That was four years ago. This yarn sat in my stash for the length of a college education. And it is by no means the oldest thing in there. I’m not sure how I feel about that. 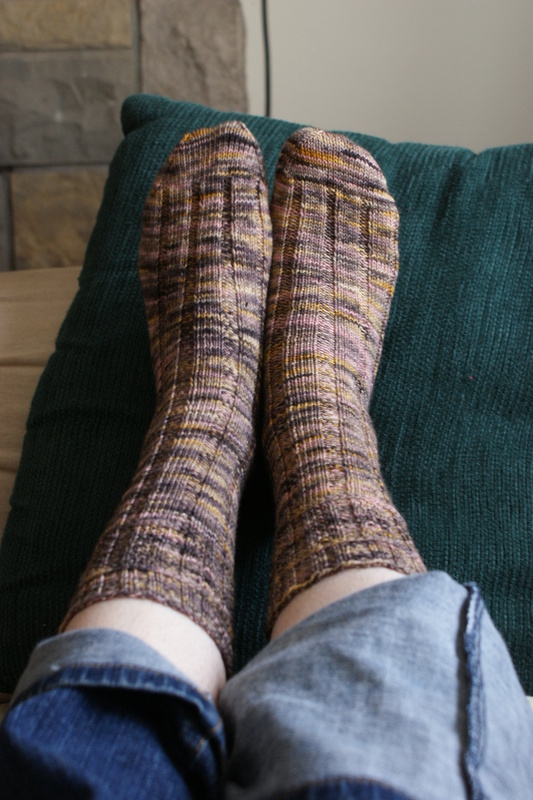 Well, it confirms that a significant purpose of this self-imposed pair-of-socks-a-month club is doing its job, as I have lots of yarn in the stash that is too good to moulder forever! And this stuff is good. It succeeded in not pooling the whole way down, even on the instep, where I often run into trouble. 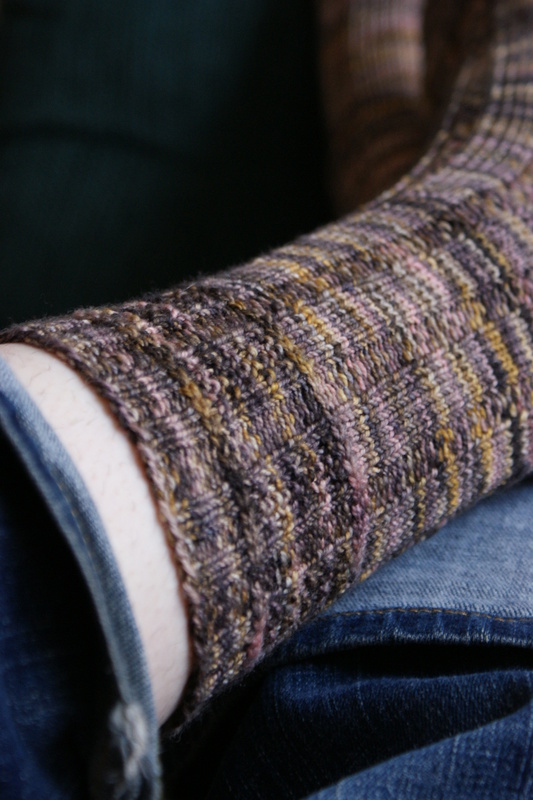 The only annoying thing about it is that it’s expensive, and two little skeins were just barely enough for narrow socks at a women’s medium, with a 7″ leg. 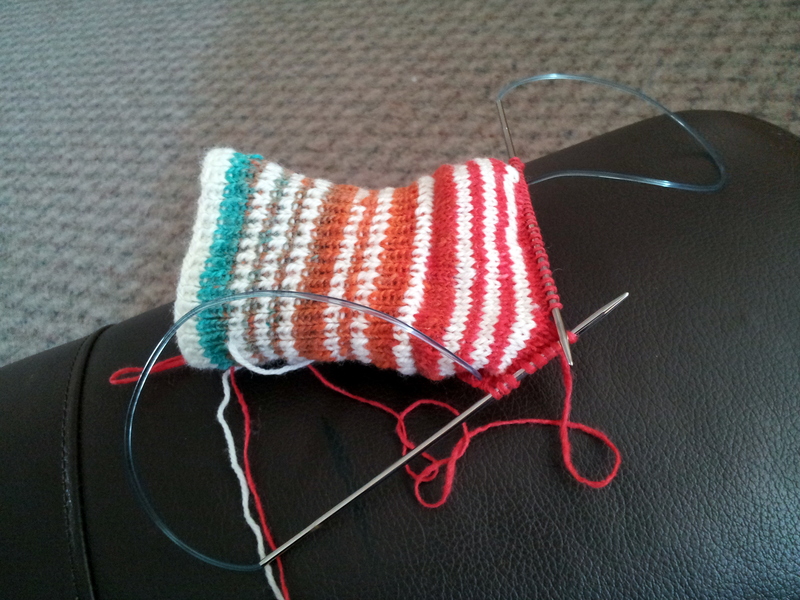 Next time I use KPPPM (I have another pair of skeins for an upcoming month), I’ll plan on a shorter and wider leg. The little diamond pattern in the cuff didn’t show up much with all the variegation, but that was my fault on pattern choice. I’m still content. Pattern review: “Spey Valley” from Knitting on the Road by Nancy Bush is a plainer pair in the book, and I’m very happy with it. I needed something plain to knit up quickly. I’m quite enchanted with the little braids that border the textured cuff; their execution is unlike anything I’d ever seen before. I must make a note of it for using on mittens or something. My gauge was a little small, so these are quite tight on me. But I have a feeling these aren’t going to stay mine anyway. 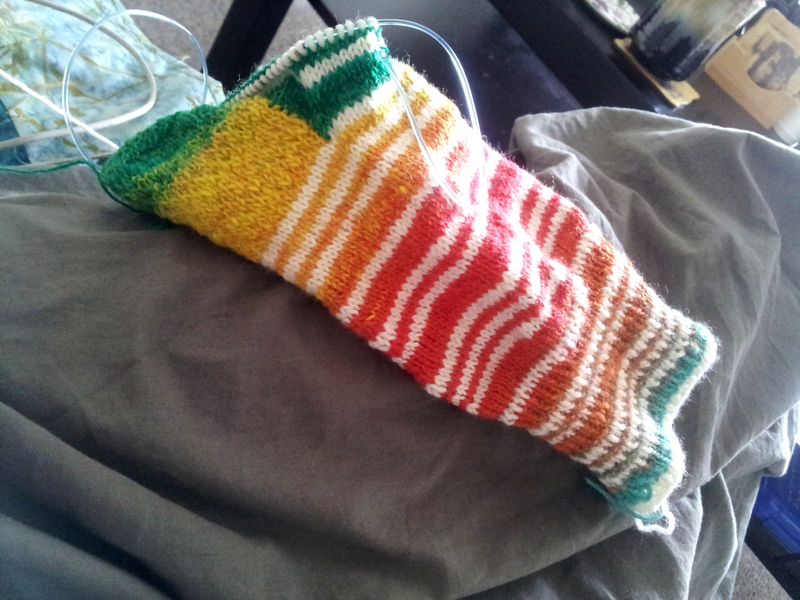 My only modification was to use a grafted toe with decreases on the sides. 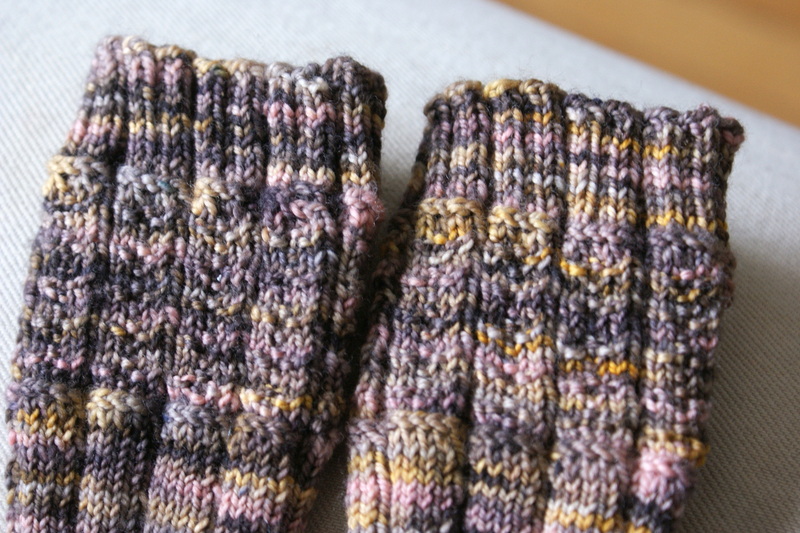 As I’ve mentioned before, I keep having to repair the toes on socks that finish like the top of a hat – decreasing down to a few, then putting the yarn through and pulling tight. I’ve given up on that sort of toe. The trouble of a kitchener is worth it, since a little extra finishing is way less annoying than repair sewing. March may be a scoundrel, or I just a craven little frozen-toed grumpasaurus who hasn’t slept in for a year, but I will take this nasty month’s occasional gifts. 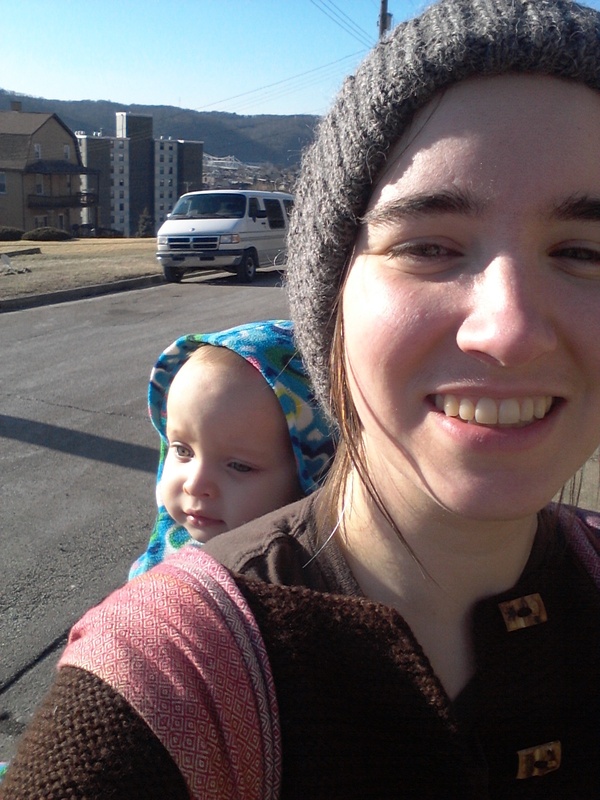 Yesterday it got up to 50 degrees, and Nomes and I were desperate for a walk. The sky was so blue and clear it might have been a still lake. The sunnier part of my disposition was warmed every so slightly, especially by the company of my friends’ rock-collecting kids. But my defenses are still up. It’s supposed to be warm again today, but March, I’ve got my eye on you. This month’s socks are ready to help me fight back. It’s hard to believe that Naomi was a bump under my shirt when I started knitting through this book of socks, and now she is old enough to help me pick yarn. I laid out the remaining months’ worth of socks in front of her, and (perhaps unsurprisingly) she went for the loudest bag. 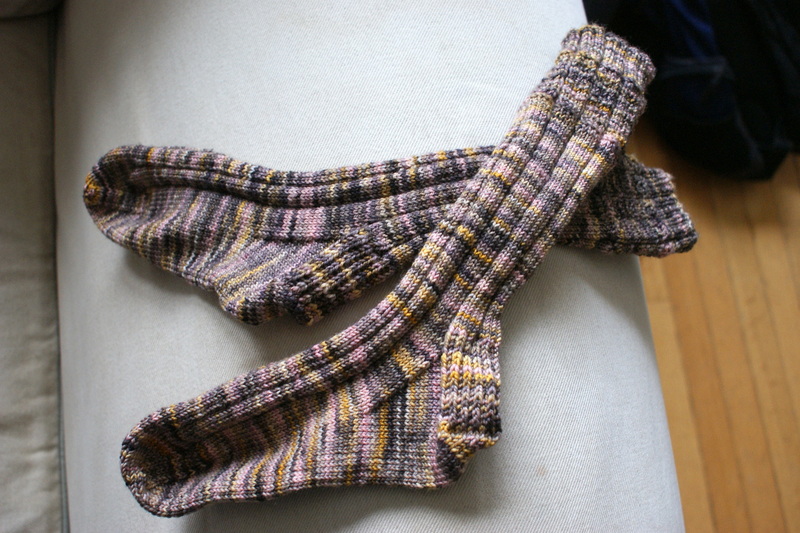 Noro Kureyon sock. In the also romantically-named S182. Good choice, baby. We’ll make it through to springtime together. Maybe we should plant some seedlings. You know, as an act of faith. It will be at least a few more weeks before we take the plastic off the windows, and then the world will be awash in mud for a few more, but it will happen. 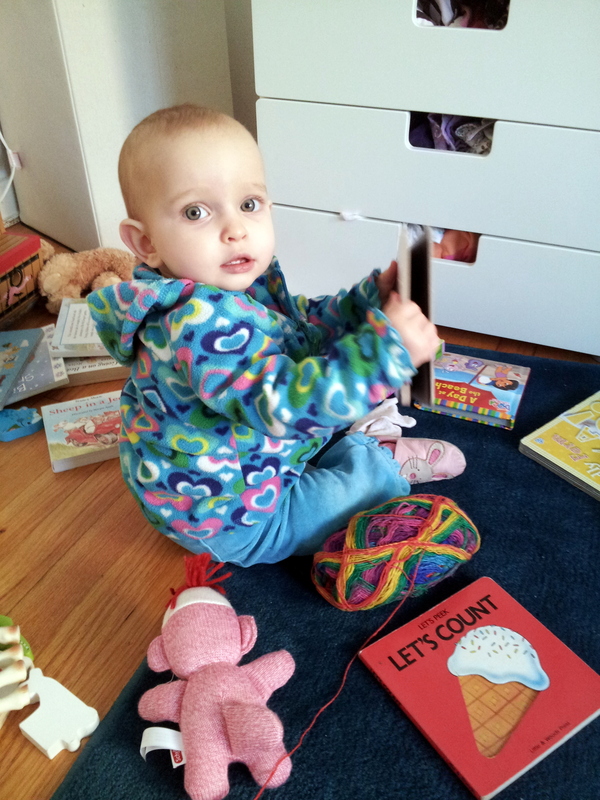 Keep knitting–Spring is coming! Officially the first day is not for another couple of weeks. Are you going to the Pittsburgh Knit and Crochet Festival in Cranberry next weekend? Haha! I don’t know if I’m going… I should go at some point, but it’s hard to stomach paying 15$ just to go shopping! When are you going?